As some of you may know, I’m losing my job at the end of March. (Anyone want to hire a writer? I use my coworkers as recipe testers!) My company was acquired, a bunch of us were given termination dates, blah blah blah. Needless to say, everyone at the office has been super stressed. And when you’re stressed, you crave sweets. Right? Right. And that’s where this recipe comes in. Brown sugar, butter, flour, and salt–it can’t get much easier than that. And we all know anything that has brown sugar and butter as the first two ingredients can only be delicious. And to make these even better, they are chewy on the inside, crispy on the ends, rich, and have just a hint of salt. Note from the LA Times: This recipe makes enough dough for 2 pans of cookies, so you can try a pan of each variety if you’d like. Because they’re baked in pans, the wedge cookies will retain more moisture, giving the cookies a chewy texture. Conversely, the bar cookies will be crisp because they are baked on an open, flat sheet. Heat the oven to 325 degrees. In a stand mixer or medium bowl with electric beaters, beat the butter, sugar and salt until creamy, about 2 minutes, being careful not to overmix. Gradually beat in the flour, working in the last one-half cup with your hands if necessary (the dough will be stiff). Divide the dough in half. To make chewy wedge-shaped cookies, butter 2 (8-inch) metal cake pans and line with parchment. Butter the parchment and press each half of the dough into a pan. Smooth the top with the bottom of a buttered measuring cup. Prick the dough with a fork in a decorative concentric circle pattern. Refrigerate the pans, uncovered, for 30 minutes. To make crispy bar cookies, shape each dough half into a 10-by-4-inch rectangle on a lightly floured board. Run a blunt knife or your fingers along the edges to straighten them (it doesn’t have to be perfect). Carefully lift each rectangle onto a buttered baking sheet, lifting both edges with your hands. With a blunt knife, score each one once lengthwise without cutting all the way through. Score crosswise 11 times to make 24 rectangles. Prick each one several times with a fork. Refrigerate the sheets, uncovered, for 30 minutes. Bake both the wedge and bar shortbread until lightly brown along the edges, 25 to 30 minutes. Remove and cool for 5 minutes, then slice the shortbread while still warm (if the cookies are allowed to cool before slicing, they will crumble). Unmold the wedge shortbread by running a knife around the edge of the pan to loosen the cookies from the sides. Gently flip the pan over, then slice the shortbread into 12 wedges. Slice the bar cookies all the way through the scored marks before moving to a cooling rack. Those sound wonderful. I love shortbread but have never made it! I love brown sugar and I love shortbread, so I’m sure I will love this recipe. I’m carious to see how the “crispy” version turns out. p.s. Sorry to hear about your job! I love shortbread, and must try this! How wonderful, thanks for sharing. I’m so sorry to hear about your job. 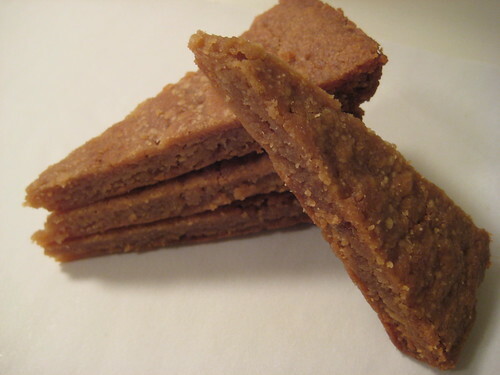 However, if food could be a total remedy, it looks like your brown sugar shortbread would do the trick. You have insighted quite a craving. Can’t wait to try these yummy looking treats! you’re on a brown sugar kick lately! how is the job hunt going? i just left dei…. who knows, they might have an opening that’s better than nothing! These look is absolutely delectable! Yum, this looks great! Especially because I can make it with things i normally have on hand. Thanks for sharing it with all of us! Ouch. It’s way too bad about the job. Thank you for the cookie recipe. Because of some of the people I know who are allergic to eggs, I’m always on the lookout for a cookie recipe sans eggs. You inspired me and I had to make this; it was SO good! I’ve always been afraid to make a shortbread recipe, but this was easy and delicious. Thanks for making it and posting about it! Another Dawn, yay, I’m glad you liked it. I was also surprised at how easy it was!